So many numbers. Here’s the marketing KPIs we look at. I’ll never forget the time our CEO walked into my office proclaiming that a particular region had launched, the best promotion ever. He truly believed this promotion would transform our promotional marketing and as such, we had to roll it out across the globe. Ok, I’m exaggerating his enthusiasm – but only slightly. To be clear, I liked the promotion but was wary about its performance. When he left my office, I looked at our numbers from region to region and discovered that his claim was not driven by fact but by gut (he liked the creative). This region did not outperform the others – in fact the overall campaign ROI and contribution to revenue fell short. Gut is great, but gut is better when numbers help to guide the way, especially when you don’t completely agree with your stakeholder’s (CEO, investor, partner) stance. So, do you have systems in place to track your marketing outreach? If you’re like many, you don’t. You plan, spend and then have a gut feel for what’s working and what’s not. That’s fine but if you are striving to optimize your return on investment, you must track and you must track the right things. Create a strategic plan to track your marketing activities. Perhaps you have system in place to track but you’re drowning in a sea of numbers with no idea what to track. If this scenario sounds like familiar, you are not alone. I’ve worked with many companies that have put systems in to place to track but have no idea what to track to effect a change. If you question for a second whether you should track consider this. There are a bunch of marketing activities that in a silo seem cheap. In aggregate, however, the wrong series of investments could be the death nail for your business. I’ve seen it happen. Lost money, lost time, lost opportunity. 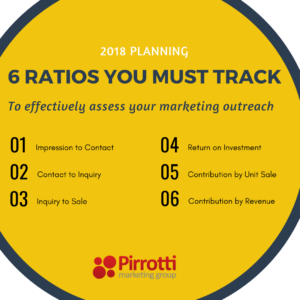 Track these ratios and you will build a solid foundation for maximizing your marketing activity. orking, and what’s not – faster. But since you’re here reading this post, let me give you a quick overview of what track. It’s important to have clear definitions around each KPI, and to be consistent. You will also need to agree on the timing correlation between inquiries and sales. We address that all in our tool. ROI is important but not enough. Look at overall contribution as well. Why do I look at these three areas? Let me give you an example. I advertise a widget on CraigsList. The ad placement is free. I get one sale worth $1,000. So the ROI is amazing – 5000x right! But that’s all I get for the entire month. So, while my ROI is great, my contribution by unit sales is terrible (.05%) and my contribution for this source by revenue is also pretty bad at 2%. Now, are you going to give up CraigsList? Well, likely no – because you’ll take the $1,000. But, are you going to invest a bunch of time in CraigsList? My answer would be no, because your return on time investment is not good. Of course, this is a very simple example, for illustrative purposes only, because you could argue that if you efficiently invested more resources you may be able to generate more revenue. From a timing standpoint, track monthly and then you will also want to have a cumulative report. The cumulative report will address the “source” and level out seasonality factors. I’m practical when it comes to numbers. I really focus on trends. So, I’m hopeful that I’ve given you enough to get started. Of course, if you would like to learn more, check out our Marketing KPI tool in the Marketing Library. The Marketing KPI Tool includes: A short video explaining how to fill out the worksheet (we call it a tool), a sample tool, and then a blank tool for you to start tracking immediately. If you like what you’ve read, please “like us” and share! 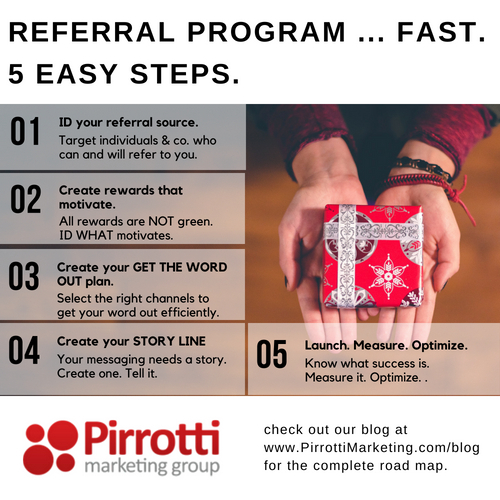 Let’s connect, and I’ll give you a Marketing KPI “Do it yourself” tool. Free!